(no need to delete as appropriate). On the plus side, in one comment, the seer said he could see the little girl I portrayed, running around in her pretty dress, red sandals and white ankle socks. Exploiting the positive, then, and by way of counteracting the Dark Triad, I thought I’d post two pictures of little-me in a pretty dress (no sandals or white ankle socks visible, sorry). Plus one of several little people, including little-me, eating lunch with a big person. After which, normal service (trees and walks and rants and things) (and relative anonymity) will be resumed. 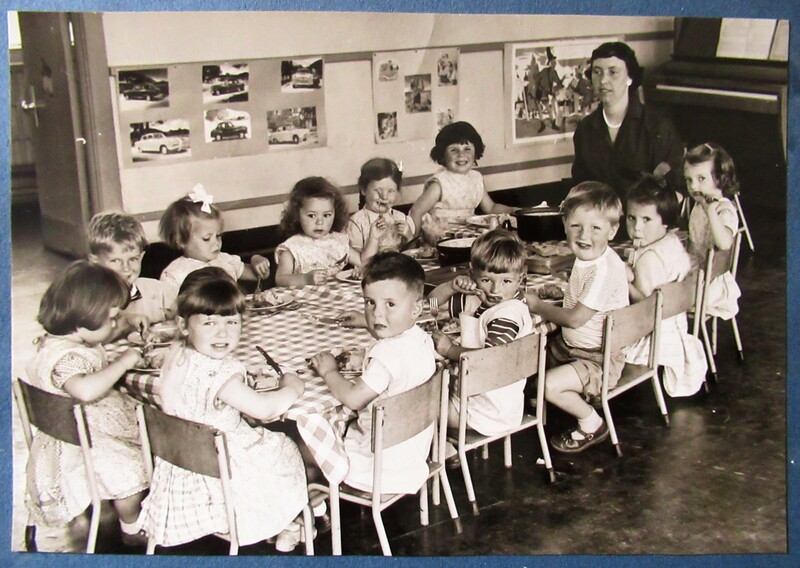 The pictures were taken at nursery school. Probably the last time I posed for a picture and enjoyed it (going by the look on my face – I have no memory of it being taken). I hate having my photo taken so you won’t find many of me online and where you do you will find it hard to see what I look like. 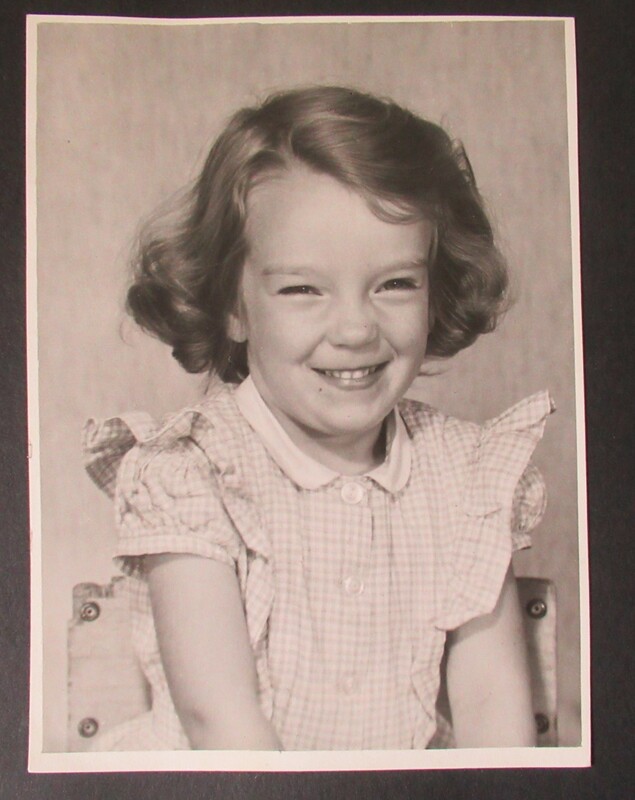 In these pictures I was three, or thereabouts. My mum had been taken into hospital for an operation, which went wrong and rendered her deaf in one ear. For little-me it meant that one day I was sitting on the breakfast table enjoying ‘listen with mother,’ as she drank milky coffee, next day I was all alone in the company of a load of other little human beings. And one big one. It was all rather unexpected and frightening. Some days were good, some days were bad. I never slept during afternoon nap time, when Miss Tickell would sometimes put her stockinged feet under my little blanket as she knitted. I was often rather scared, used to hide in the lavatory when the nit nurse came. And I think the introspection may have started here, judging by photo two. I have since stopped licking my plate, which was occasionally permitted. Which sounds unlikely, I know. Perhaps it wasn’t and I was just being treated with extra tolerance. I have also stopped playing the triangle. And the bang-them-together-in-time-with-the-music sticks. Things it is hard to do wrong. But odd to do alone. One’s creative world does not always change for the better, does it? And I still yearn for red sandals. But not white ankle socks. 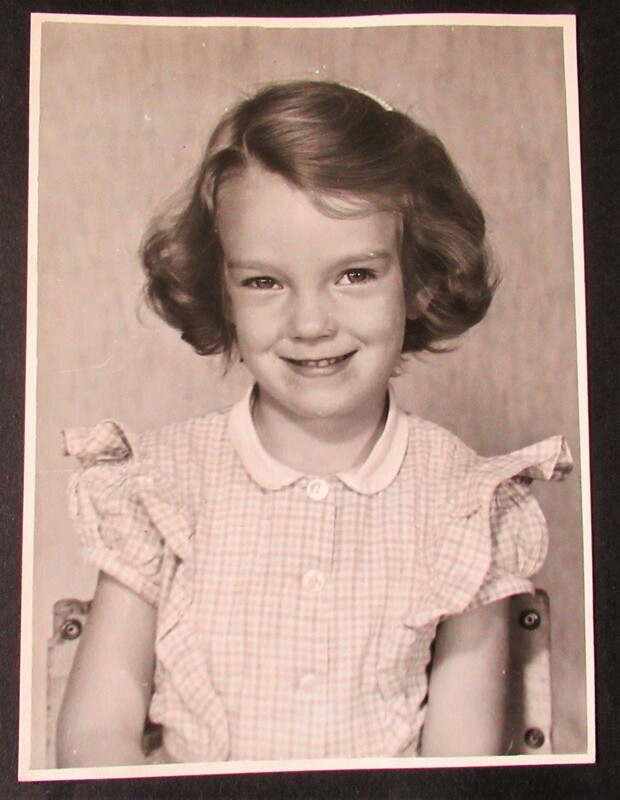 This entry was posted in Britain now & then, Thinking, or ranting, or both and tagged little-me, nit-nurse, nursery school, photographs, plate-licking, pretty dresses, red sandals, sticks, the triangle. Bookmark the permalink. Photographers get little kids to smile by telling them silly jokes. Perhaps that’s what happened in your case! Cute photos, by the way! Ha! The nit nurse came round to schools and sat you on her lap and checked your hair for nits, among other things! I was terrified of her! Oh that’s funny, for I was thinking of ‘nit’ in terms of ‘nitwit’!!! I couldn’t figure why they would send a nitwit nurse around to the schools. 😀 I can see why that would be frightening, having somebody pull you onto their lap and start poking about in your head! Bearing in mind what poor health Britain had in the post WWII years… the welfare state fed children rosehip syrup/cod liver oil well into the late fifties, daily milk till Thatcher’s era and they also checked for a variety of things including height and weight. Yeah, I hate people poking about in my head to this day!!! Rosehip was ok – even the gel capsules of halibut or cod liver oil used to resurface later and I hate very fishy-tasting fish to this day. You were unlucky with your nuns – mine were non-physical and mostly, to be honest, rather nice. Except one. Shiver. Psychological torture! I bet sometimes this lovely child makes her presence known, in certain light,s expressions and activities, as well as the desire for red sandals. Our child-self never leaves us. And mischief 😉 You’re right, I think having an inner child keeps us alive, mentally. Thanks, Dale, as ever, for reassuring and kind comments. Adorable photos of a young Mary. It is interesting to contemplate what precipitates things like no longer wanting to have a photo taken, or play the triangle, but I’m with you on the red shoes…still contemplate buying a pair every now and then, something very fun about the idea. Playing the triangle is probably not much fun in isolation. But red shoes – there’s just something, isn’t there? Not Dorothy-spangly red either, it’s that cherry red leather.